BluSynergy gives you the capability to set up Promotions or Specials. The promotion could be a percent or a flat amount. The term of the Promotion is flexible and could be set to suit your business. Multiple Promotions may be created. In the Edit Promotions page Fig 2 that opens, enter a “Name” for your promotion e.g. EB2013. or you could have the "promo code" automatically generated by the system by selecting the "Generate Promotion code". Enter the “Promotion Code”. This would be the code that you would enter when creating a new order for your customer. Select the “Type of promotion” you want. 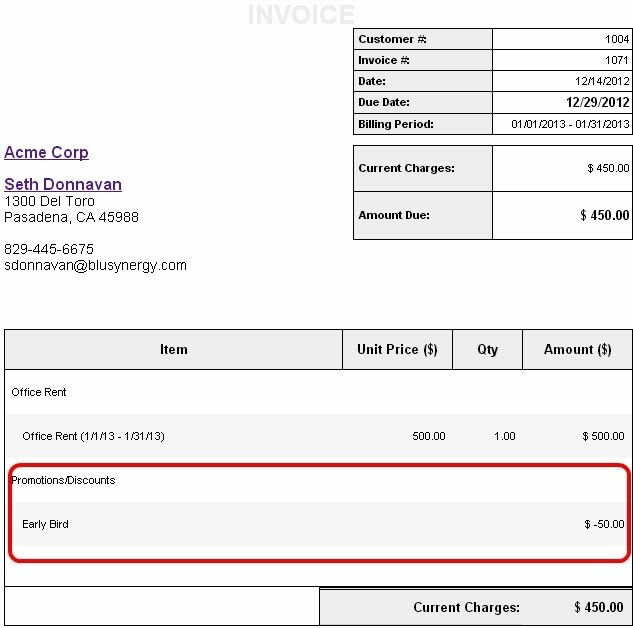 It could be a one time promotion, which would be applied to 1 invoice or it could be a recurring promotion that would be applied to all invoices generated for the customer for a specified period. Check the “Is Active” box to activate the Promotion. Enter “Amount” if it is a flat rate e.g. $19.99 per invoice. Or Enter percentage e.g. 5%. Enter “No. of periods”. This determines how long your promotion will remain active. So for e.g. if you enter the value 3 in the “no. of periods”, then the promotion will be applied for the first 3 invoices.So if you are invoicing your customer monthly, they will be charged for the first 3 months. 4. 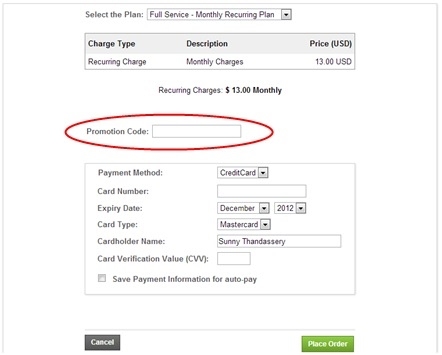 If you are logged in as the Administrator, you would enter the "Promo Code" when creating a New Order for your customer, in the Edit an Order (Fig: 3) screen. In the case of "self signup" models, your customer will be able to enter the Promo code as shown in Fig:3.1. Usually,this screen is embedded in your website using IFrames to maintain the look and feel of your website.